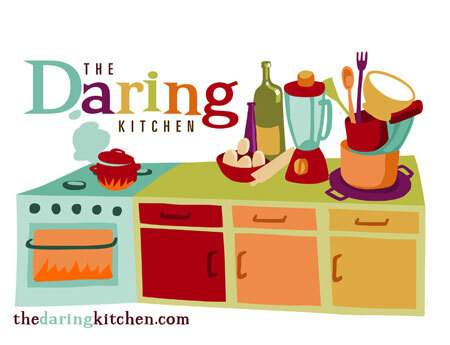 Well, fellow Daring Bakers, it seems we can do anything at all if we put our minds to it, even inspire the Boston Red Sox to their second World Series sweep in 4 years! The collective power of hundreds of Bostini Cream Pies baked over the course of the month was no match for my solitary, yet tasty, rocky road tart on Saturday. For those of you who haven’t been in on it, the Boston-related dessert I mentioned yesterday was indeed this month’s Daring Bakers challenge: the Bostini Cream Pie. Because I saved this challenge for the end of the month, on a weekend when we already had 75% of a decadent brownie tart already in the fridge, I decided to cut the recipe in half. This was no minor feat, as you’ll see if you take a gander at the original recipe: odd measurements all over the place! I also decided, as allowed, to make a substitution for the orange juice and zest that flavors the chiffon cake element. In their place, I decided to use coconut milk with a bit of desiccated coconut and a touch of coconut extract for oomph. We’re not fans of the chocolate-citrus combo, but chocolate-coconut is another animal altogether. I was a little worried about my chiffon cakes because of the abovementioned reduction and substitution. I’ve also never had as much trouble separating eggs as I did for this recipe: several of the yolks broke, and I kept having to fish little wisps of it out of my whites. As a result, my whites didn’t whip up quite as much as I might have liked, and the batter seemed kind of runny and flat. 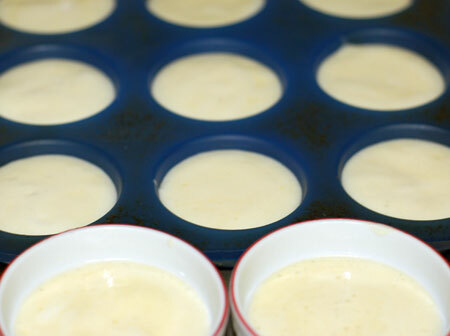 I dripped it into a muffin mold and several small ramekins, and crossed my fingers. As you can see, I needn’t have worried. My little cakes puffed up nicely and browned just slightly on top, though the ramekins, being larger, did need several extra minutes to bake. They came out tender and moist, with a light coconut scent. Next, I tackled the custard. 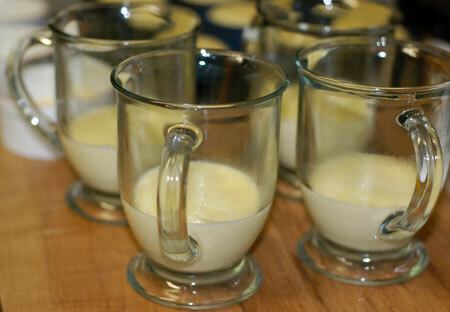 Since I’ve had quite a few custards separate on me, I was more than a little nervous about this one, but it gave me absolutely no problems, other than trying to figure out appropriate vessels in which to pour it. 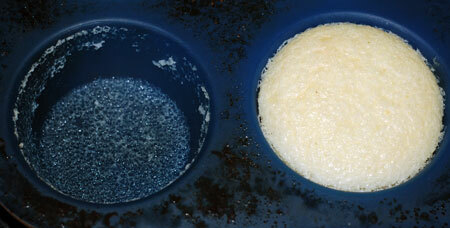 I did use vanilla extract added at the end, rather than a bean; but to my credit, it was Sonoma Syrup Co. Vanilla Crush, so I still had those appealing little flecks of bean. Once everything else was ready to go, the chocolate sauce was the work of a minute. I toasted some coconut for a garnish and put everything together. We dug in during the 9th inning of Game 4, and it was a more-than-fitting way to celebrate the Red Sox victory. As rich as this dessert was, it seemed very light, and we both really enjoyed it. The coconut flavoring in the cake was to our tastes, and if I may say so, I thought my toasted coconut garnish added much-needed textural crunch in an otherwise pillowy-soft dessert. Thanks so much to Mary of Alpineberry for choosing such a delicious—and very aptly timed—baking challenge. You can find the recipe for this fine dessert at her blog here. And be sure to check out the 200-odd other Daring Bakers’ versions of this dessert on our blogroll: I wasn’t very creative with my presentation, but from the previews I’ve seen, there were some spectacularly beautiful Bostinis made this month! I’m a fan of the citrus/chocolate combination, but this sounds so wonderful as well!! Wow, those look fabulous! I love the switch on the flavor, too! 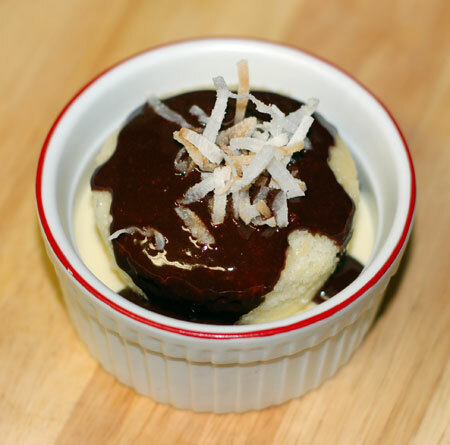 Chocolate and coconut sounds lovely, nicely done! Wow, I think I have those ramekins too! The bostinis look so cute in them! Very creative, to substitute coconut for orange (though I’m not a fan of either combination). I love, love, love the coconut variation! Yum yum coconut and chocolate! Boy o boy. BoSoxini Cream Pies with coconut. Oh, you are messing with the old emotions, here. Next time company comes, I just may try that taste sensation. Mmm. Love those Mounds Bars, ya know? I didn’t think of coconut, but that sounds so good! I would totally try that next time! Beautiful variation! I used coconut water in the chiffon cake and it worked perfectly also. Very cute ramequins! I hope your pregnancy is going well! If I make this again, I’m going to do it with coconut milk. I imagine it’ll taste a bit like a Mounds candy bar! wow what a neat idea and I love your little cups so pretty. Wow, that sounds really yummy with the coconut and chocolate combo. And your cakes puffed up so well, I love it! Oh yeah, and congrats to the Red Sox, gotta love ’em. Beautiful – those look great. I am so curious how it tastes with coconut now! These sounds so good with the coconut! Julia, I really like the coconut idea. Like the glass mugs as that seems like it’s getting close to as reasonable a portion as is possible with this dessert! Glad you had a good time with this one. We really do seem to have the power! Guess that means the force is with us as well. I knew the DBs had the power to take over the world! Well, the World Series, at least. Great job on your Bostinis. You did a lovely job on your bostinis. I love the BoSox name for them. I used coconut milk in the custard and used coconut oil in the cake. Still the cake was not my favorite…it just needs something else. Mounds bars are the best (though I wouldn’t sneer at Almond Joy either)! I was really pleased with how the coconut worked in this dessert, but I have to admit I got the idea from the Daring Bakers blog. My first thought was to use Knudsen’s coconut nectar, but the stores around here just carried the pina colada one, so that was out. I liked my little red-edged ramekins for this dessert because of the Red Sox connection, but I really need to get some more interesting vessels for presentation. I’m getting bored taking pics of the same things over and over! Natalie, I have a jar of coconut oil at home, and it didn’t even cross my mind to use it in the cake. Great thought! I did consider using coconut milk for the custard also, but I really wanted to use up that cream. They look gorgeous! Very pretty and yummy! Nice presentation and love the coconut garnish! Your team and bostinis are 100% winners! Wow, they really look lovely! I really need to try the coconut version someday–everyone who used coconut raved about it! Well done! I’m so happy that someone used coconut in their bostini! Well done! 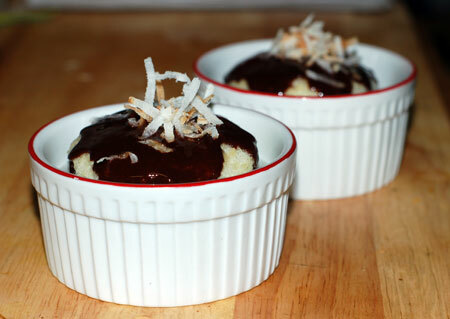 The coconut turned out to be a perfect option for citrus-chocolate dissenters like me. And it made up for the fact that the mixed bag of Halloween candy we got had absolutely no Almond Joys in it—false advertising at its worst! Claire, we are big fans of the underdogs, so we were totally rooting for the Cubbies in the post-season too. We were sorry to see them get swept by the D-backs. I went with the chocolate-citrus combination for round one. There will be multiple rounds with this one, as it’s a stunning dessert that serves a crowd, and we’ll be doing lots of holiday entertaining. I have seen a couple coconut ones now and think that is the way to go…looks great.